Note to SRC: my deepest apologies to Wendy for the late link-up. It's Secret Recipe Club time again, and this month's assignment is Wendy from La Phemme Foodie. Wendy blogs from Philledelphia, where she's a lawyer by day and a food blogger and photographer by night. For the assignment, we considered several recipes, including slow cooker ribs in a root beer barbecue sauce, as buffalo wing macaroni and cheese, but in the end, I had a craving for a sandwich, and her Cuban sandwich won the day. We made a few changes to the recipe out of necessity. On the shopping trip for ingredients, no matter how hard I tried, I couldn't find roasted pork. Our grocery store doesn't have a proper deli, so we're stuck with packaged prepared meats. They did have sliced roast beef, so I picked up some of that. Meredith was quick to point out that it's very unlikely that you'd be able to find a Cuban sandwich anywhere that's not made of pork, and it's even less likely that you'd find one made of beef, given the abundance of pigs and the lack of beef cattle. We also decided to use a French baguette instead of a plain kaiser roll. That's was simply because I'm not keen on huge, overly heavy breads. Preheat a panini grill to medium. Combine pickles and peppers in a small bowl and set aside. Spread 1 tbsp mayonnaise on the bottom half and 1 tbsp mustard on the bottom of each sandwich. Layer the remaining ingredients in the following order: ham, roast pork (or beef), pickle mixture and cheese. Gently flatten sandwich and spread margarine on the top. Transfer the sandwich to the panini grill and cook for 3 to 4 minutes. Serve immediately. You had me at Cuban Sandwich--ah, my fave! I love the French Baguette idea, too. I love the way you adapted it. Definitely one of my favorite sandwiches! My husband would be with you on the baguette. It's his bread of choice for everything. Your sandwich is making me crave one right now! Pickles and Peppers have me right there, this is a great sandwich that I would just love. Great selection for SRC! great pic, we have a restaurant that we go to get these but how nice to make them at home. We love cuban food but never make it at home. Looks delicious. Daniel, that sandwich sounds yummy. I can't wait to try it. One of my favorite sandwiches! Yum! Great looking sandwich! 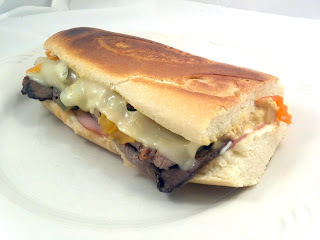 I had a Cuban sandwich in the Hotel Nacional in Havana just a few months ago and yours looks exactly the same! I love the warm crust on a grilled sandwich like that, your beef substitute with the ham would have been although not authentic, delicious! Love your adaptations and your sandwich looks and sounds wonderful. If you haven't already, I'd love for you to check out my group "A" SRC entry: Double Chocolate Mousse Cake.